Ministirri Muummee Dr. Abiy Ahimad affeerraa pirezidantiin Faransaay Imaanu’eel Maakroon isaaniif taasisaniin kaleessa Faransaay turtii taasisaniiru. ለ ጠ/ሚ አብይ አህመድ ከፖለቲካ በፊት ሰውነት ይቀድማል፡ ከምርጫ በላይ መሳም ይበልጣል. ሰው ሰው የሚሸት መሪ . 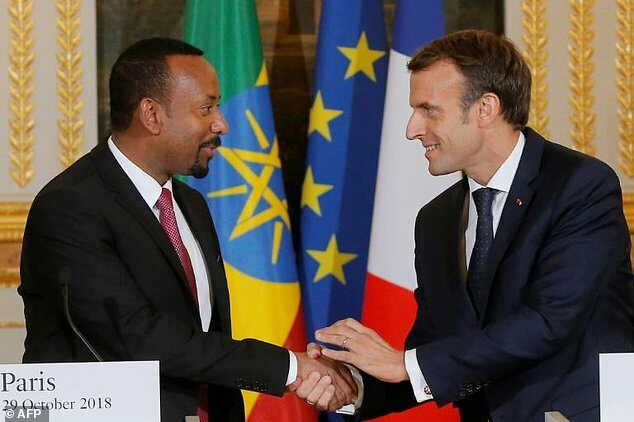 French President Emmanuel Macron on Monday hailed “unprecedented” moves by Ethiopian Prime Minister Abiy Ahmed to transform his country as the young African leader makes his first trip to Europe. Abiy, 42, has won global praise for forging peace with neighbouring Eritrea, announcing economic reforms and reaching out to dissidents, but is grappling with bloody ethnic disputes which have displaced some 1.4 million people. Macron offered “all my support and that of France” in reforming Ethiopia and “in calming domestic tensions”, telling Abiy at a press conference in Paris: “You have here a country which loves yours but also admires the transformation you are carrying out”. “I know how much he has risked to see these reforms through and how much these reforms are fraught with difficulties, but also how much Prime Minister Abiy Ahmed has chosen a courageous path,” Macron told reporters. “The political, economic, social and cultural transformation that you are in the process of carrying out and that you’ve committed to in Ethiopia is unprecedented,” added Macron, another leader keen to present himself as a reformer. Abiy vowed to tackle the violence gripping Ethiopia, saying it would be resolved through “greater peace-building in the whole country”. “The communal conflicts cannot undo the reform agenda,” he added, arguing that economic reforms would help end the violence by bringing greater prosperity. “The reform process is contributing to greater peace in the country,” he said. French officials signed a string of cooperation deals with their counterparts from Africa’s second most populous nation, in areas ranging from transport and energy to culture. French experts are set to advise Ethiopian officials on how to open the national palace, dating back to the rule of Haile Selassie who was emperor until 1974, to tourists. 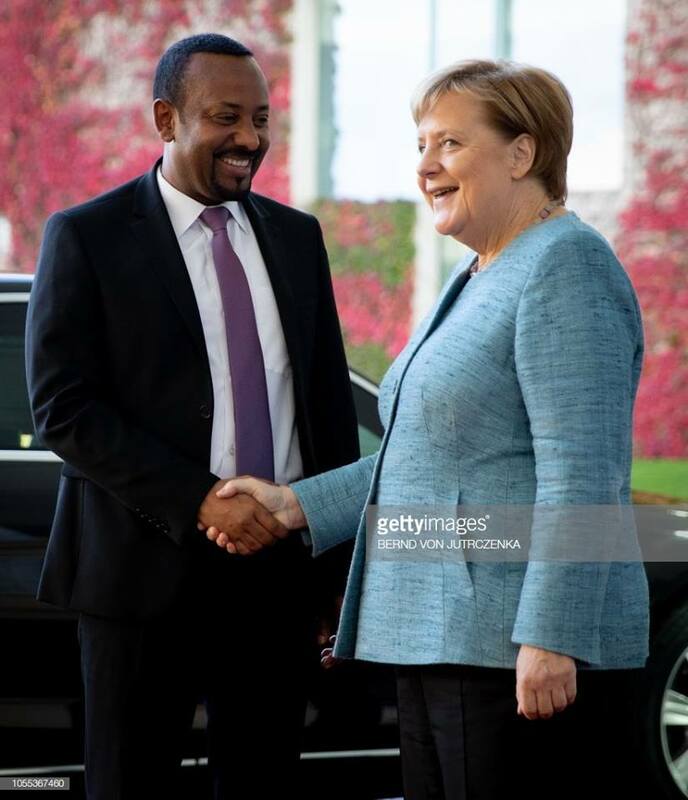 Prime Minister Dr Abiy Ahmed on Tuesday arrived in Germany on the second leg of his three cities Europe tour. He was received by German’s Chancellor Angela Merkel. The Prime Minister is expected to have bilateral discuss with Merkel shortly. The Premier will address 25,000 Ethiopians drawn from different European countries in Frankfurt tomorrow. Moreover, he will attend the second edition of the Compact with Africa (CwA) meeting schedule to take place later today. At least 12 African heads of state will also attend the event. The CwA was initiated under the German G20 Presidency to promote private investment in Africa, including in infrastructure. The initiative is demand-driven and open to all African countries. Since its launch in 2017, the CwA has sparked great interest. The current Ethiopian leader, Abiy Ahmed, appears to be a peacemaker with a developmental agenda for the wider region. He has wasted no time to end the senseless war with neighbouring Eritrea. The peace with Eritrea is part of Ahmed’s broad strategy of reforms in Ethiopia. He has filled half of the national parliament with female MPs, breaking with the tradition of having a male-dominated national assembly like most African countries.